Learn how to get started with Microsoft Azure. I have received many requests from readers to put together technical articles about the Cloud and especially Microsoft Azure and Citrix Cloud. According to the VDILIKEAPRO 2018 survey, Microsoft Azure is the first cloud provider for cloud-host Citrix deployments. If you are looking to deploy Citrix products in the Cloud, there is a big chance that you will consider Microsoft Azure. In this first article, we will review how to start with Microsoft Azure and we will dig in with few basic configurations to get the environment ready for Citrix Cloud. Microsoft Azure is a cloud computing service launched in 2010 by Microsoft that supports IaaS, PaaS, SaaS and more. As of today 600 services are supported on Azure, not only Windows services and applications but also open-source tools and technologies. The main competitor is Amazon AWS. Important: Azure Trial is limited to a ridiculous 4vCPU usage in the same region. To unlock more, you have to move to a pay-as-you-go subscription model. Click on the Start Free button. Then select Start Free on the second screen. Microsoft Azure is compatible with Microsoft Accounts, so if you want you can link your Azure account with your regular Microsoft Account. That’s also great because Citrix Cloud supports Azure AD. You will be able to administrate both Citrix Cloud and Microsoft Azure with the same credentials. Next step is to configure your account details. Enter your phone number do the phone verification step. The next step is to configure your credit credit card information. Nothing is free. And with Microsoft Azure you will learn that very quickly. Once you have all configured, accept the subscription agreement. I would tell you to read it but it is so long. You will be redirect to the Microsoft Azure dashboard (In case it is here: https://portal.azure.com/). On this screen, you will be able to see what’s going on on your environment. That’s all for your account setup. You can check your subscription in the Cost Management – Billing menu. As you see on the screenshot below, we are using the Free Trial for this article. We are limited to $200 credit from Microsoft. You will see very soon that it is not much in the Microsoft Azure world. I will use my own public domain in this setup and I will use my local AD server located on premises. I figured that most corporations already have an active directory locally and will do the same steps as below. So the first step here is to add a custom domain in the Azure AD configuration. By default you are getting something like nicolasignotomsn.microsoft.com. In this example, I’ll be using citrixguru.com as my primary domain. Note: Azure AD is not really an Active Directory. You cannot add machine in this AD except Windows 10 clients with Office 365 subscriptions. You either have to use your local network Active Directory (with Azure AD Connect) or setup your Active Directory directly in Azure by building at least 1 virtual machine and install the Active Directory role on it. Select Custom domain names in the Azure Active Directory screen. And select Add custom domain. Then add your selected domain, here it is citrixguru.com. You will need to reconfigure you domain with Azure settings. It will looks like that in your registrar DNS zone editor configuration. Then and after waiting few minutes for replication, you can click on verify. Azure will automatically check the configuration of the domain. Once you are ready. Select Make primary to put this custom domain as your primary directory. As you can see on the screenshot, it is needed to download Azure AD Connect and run that tool on your local network Active Directory Windows server. But first we will create a new Azure Global administrator for that new directory. Go to Azure Active Directory and you will notice that the custom domain previously created is now the default directory for this account. My suggestion is to create a new Azure Global administrator. Select Users in the left menu (under Manage) and then New User on the top. Configure the new user and don’t forget to assign the Global Administrator role. Last step is to add this user in the current subscription. Go to Cost Management + Billing and select Access Control (IAM). Select Add and look for the previously created account. Select the role OWNER for this account and save. Then logoff and logon with that user. You will have to change the password for the first time. My on-premises Active Directory is DC01 and is part of my home lab. The domain citrixguru.lab is the domain running on my on-premises configuration. To be able to use Azure, I will need to create a suffix (UPN) in the Active Directory Domains and Trusts console. There is additional configuration that needs to be done for the UPN but we will take a look at this later. Next step is to enter your Azure credentials. Make sure that your AD server has access to Internet. I also recommend you to create a new service account that will be used by Azure to connect to your Active Directory. In this article, the service account is CITRIXGURU\AzureSVC. This account is an Enterprise Administrator in my local domain citrixguru.lab. As discussed before, my local domain is citrixguru.lab and the domain that will be used for Azure is citrixguru.com. This screen is here to remind you that users with citrixguru.lab upn won’t be able to logon to Azure AD. All accounts @citrixguru.lab will be transfered with the default directory UPN (ex: nicolasignotomsn.onmicrosoft.com). If you want to use accounts in Azure, you will have to change their UPNs in your local Active Directory. Check Continue without any verified domains. The next screen is a summary of what’s going to happen. Select Install to start the process. Depending of the size of your Active Directory, this operation can take a long time. You can check that the installation was a success in Azure. Go to Azure Active Directory and Go to Devices -> All Devices. The server where we have installed Azure AD Connect is now visible here. I am sure that the question in your mind is how to force a refresh? The refresh is by defauLt every 30 minutes. It can be useful, especially during our tests, to force a sync with Azure. And here is the output. You can check that the local AD account are synchronized with Azure by going in Azure Active Directory and select Users (under Manage) in the menu. The account highlighted in Red was configured with @citrixguru.com in my local AD and was properly synchronized with Azure AD. A resource group is simply an identifier that Azure Resource Manager applies to resources to group them together. You can find more details about it here. To create a new resource group go to Resource groups in the left menu. Then select Add. The naming structure that i will use for Azure is CG (CitrixGuru) – RG (ResourceGroup) – Citrix (Role) and all my components will be located in East US. To be able to create virtual machines, you need to have a working network (obviously). By default, there is nothing in Azure and it is your job to create everything. Go to Virtual Networks and Select Add. Configure the first virtual network as below. We will create a first subnet reserved for servers with 128 IPs available. Note with Azure, many IP addresses will be reserved for Azure and won’t be available for you to use. Note: make sure to prepare carefully this step as some of the settings are not modifiable. Now select your newly created virtual network. Then go to Subnets. The first subnet that we created before should be here. We need to create a new subnet for Windows 10 clients. Select Subnet on the top. Note: not a lot of IP needed here as only few clients are planned in this design. Go to Storage Accounts in the main menu and Select Create Storage account. Note: you check this link out to have more details about Replication. Here we don’t need that so I picked the default. An Azure AD directory – either synchronized with an on-premises directory or a cloud-only directory. The Azure subscription must be associated with the Azure AD directory. You need global administrator privileges in your Azure AD directory to enable Azure AD Domain Services. In the main menu, select Create a resource. Select Azure AD Domain Services. Most of the settings will be preconfigured. Next screen is the network configuration. We are using everything that was configured earlier in this article. Add an administrator from your Azure AD. This can take a while. Once it is deployed. You still need to configure DNS. Select Configure to update the Virtual Network. Note: All Virtual machines in the network have to reboot to apply the change. Here we will create the first Citrix Cloud connector virtual machine. We will use that VM later to bridge Citrix Cloud in Microsoft Azure. Go to Virtual Machines in the main menu then select Add. 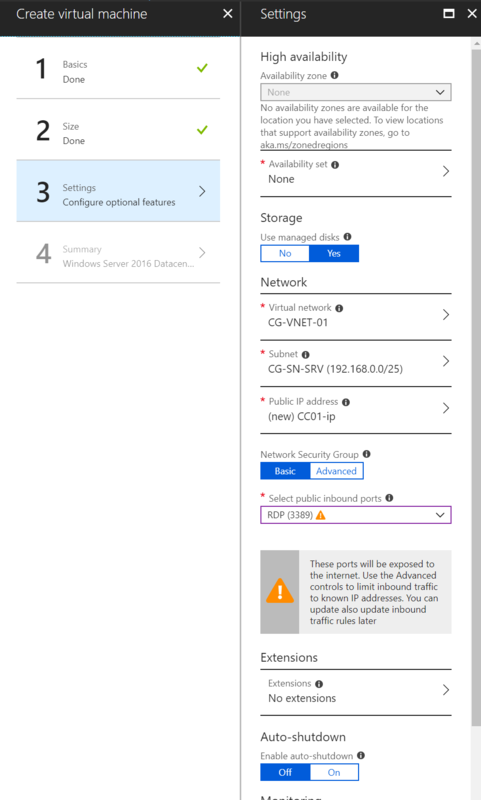 Select Windows Server 2016 Datacenter. Does not really matter here. Then Select Create at the bottom of the page. Next step is to configure that virtual machine. Then select a template. Here we will pick a low perf configuration for the example. But usually D4s_v3 or D2s_V3 are recommended depending on the size of your environement. Next Step is the optional features. I’ve configured this VM to get a public IP and to have RDP (3389) allowed inbound to simplify my administration. In a production scenario, this should not be enabled as it exposes you from internet. Everything else is disabled. See below the summary. A few minutes, the VM should be ready on your dashboard. Click on CC01, and then on Connect to download a .rdp file. Select Download RDP file to download the file. Open the file, enter the credentials that we specified during the VM creation process (ex: azureadmin). The next step is to add that virtual machine in the citrixguru.com domain. Note: you will need to change your password if you created the account before enabling Azure AD DS. If you don’t do that you will get an Account Locked Out error during the join. You can find more about this here. Reboot is required at this time to apply to domain join. Once rebooted, you can logon with your Azure AD credentials (here: [email protected]). Make sure to disable IE Enhanced Security Configuration on the virtual machine. Repeat these steps to create CC02 (Secondary Citrix Cloud Connector). Go to https://azure.microsoft.com/en-us/downloads/?fb=en-us and download the PowerShell SDK for Windows. Install it. Note: you need to logon as the owner or co-admin of the Azure account. Then select your subscription, generate and download the settings file. Now you can type command lines targeting directly your Azure account. Azure Free trial is limited to 4vCPU in the same region, which is a serious limitation. You will have to quickly upgrade to a Pay-As-You-Go plan. Go to Cost Management (in the main left menu). You should see the following popup. You will be prompted to give your subscription a friendly name. Ex: CitrixGuru Subscription. There is NO support included in Azure by default. You can decide to buy support from Microsoft for a monthly fee. After 10 mins, you will get an email mentioning that the subscription has been updated. Note: the $200 credit will still be available when switching to the new plan. To be used within 30 days. The offer is still Free Trial for now until the initial credit is used or until the 30 days limit. Then you will be charged for everything you do. That’s all for the first article about Microsoft Azure. I hope you learned something that is useful for you. In the next article, we will take a look at how to get started with Citrix Cloud. Previous articleCitrix Workspace offers the most advanced user experience. Here’s why! Founder of citrixguru.com. Citrix Architect, Citrix CTP, CCE-V & CCP-N.
Not associated with Citrix.com. Citrix is a registered trademark of Citrix Systems, Inc. Used here with permission.